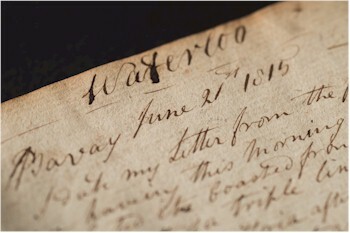 A very important manuscript in the hand of Lieut Col Robert Batty of the 1st Regiment of Life Guards relating to the Battle of Waterloo will be offered in our Antiquarian Book Sale (BK14) in the bi-centennial year of the famous battle on 26th August 2015, which will have live online bidding available. Bearnes Hampton & Littlewood have been instructed to auction a very important manuscript volume in the hand of Lieut Col Robert Batty of the 1st Regiment of Life Guards. He took part in the Battle of Waterloo and, indeed, was wounded in that conflict. Batty was the son of a Hastings doctor who himself started to study medicine at Cambridge until leaving to join the army. He was an accomplished artist and, after his army career, travelled around Europe painting and drawing. Several volumes of his pictures were published and he also exhibited at the Royal Academy. 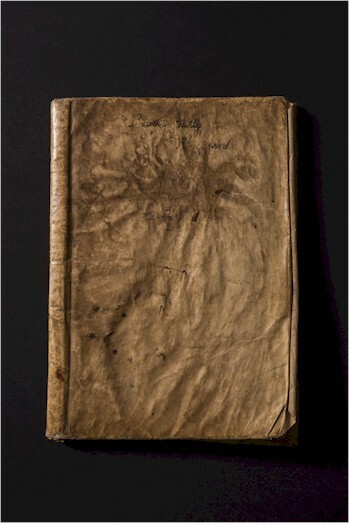 The manuscript volume relating to the Battle of Waterloo by Lieut Col Robert Batty. 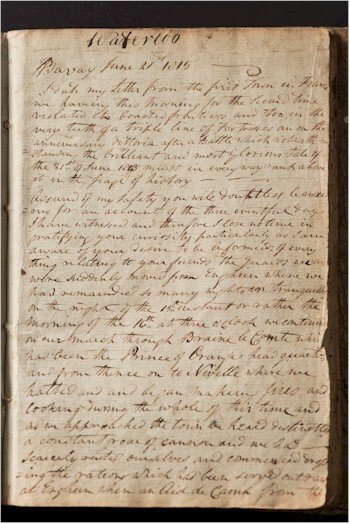 This manuscript would appear to be his fair copy of three letters written in the days immediately following the battle. He published a fuller account later, but the immediacy of this report brings home the extraordinary excitement and drama of one of the most significant military conflicts in European history. The Battle of Waterloo took place on the 18th June 1815. These accounts were written on the 21st, 22nd and 23rd June 1815 in the villages of Bavay and Gommagnies. In them Batty gives a comprehensive account of the battle with particular reference to the key site of Hougomont, which was held by the allies and mercilessly bombarded and besieged. He is in awe of the sheer intensity of the fighting and the courage displayed by both sides. He includes a marvellous description of the Duke of Wellington himself: "I constantly saw the noble Duke of Wellington riding backwards and forwards like the Genius of the storm, who borne upon its wings, directed its thunders where to burst. He was everywhere to be found encouraging, directing, animating, - He was in a Blue Coat with a plain cocked hat his telescope in his hand there was nothing that escaped him nothing he did not take advantage of and his Lynx's eyes seemed to penetrate the smoke and forestall the movements of the foe – How he escaped, that merciful Power alone can tell..."
A page from the important Waterloo manuscript. As well as some quite harrowing descriptions of the dead and dying on both sides, there are some wonderfully inspiring passages concerning the performance of the allied troops: "Never was British valour and discipline so preeminent as this occasion, the steady appearance of this battalion caused the famous cuirassieurs to pull up and a few of them ... fired at our people ... but our men, with a steadiness no language can do justice to, defied their efforts and did not pull a single trigger ...". At another point he writes "The Duke who riding behind us watched their approach and, at length when within an hundred yards of us, exclaimed 'Up Guards and at them again', Never was there a prouder moment ... for our country or ourselves ... The enemy did not expect to meet us so soon, we suffered them to approach still nearer and then delivered a fire into them which made them halt, a second like the first carried hundreds of deaths into their mass, and without suffering them deploy we gave them three British cheers and a charge of the bayonet." The manuscript volume has a pre-sale estimate of £25,000-£35,000 and will be offered in our August 2015 Antiquarian Book Sale.